Manuel Schabus was awarded with the “Kurt-Zopf-Förderpreis 2018”. In his award-winning publication he deals with the non-pharmacological method “Neurofeedback” (brain wave training) for the treatment of insomnia. 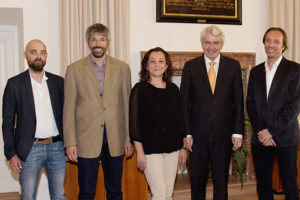 For the period 2019 – 2022 outstanding young scientists will be able to complete a fully-funded doctoral program at the University of Salzburg, will use and get support in any methods of the “Centre for Cognitive Neuroscience” (CCNS) at no costs, spend 6 months in designated international laboratories, and are encouraged to attend (fully-funded) symposia and congresses worldwide. In the Laboratory for “Sleep, Cognition and Consciousness Research”, there are currently 2 positions available for research topics by Prof. Manuel Schabus and Prof. Kerstin Hödlmoser. Applications are welcome until summer 2019 (intended start 1.10.2019). Take a few minutes and join: the first large online survey about the sleeping habits & sleep quality of the Austrians. After completing the two questionnaires, you’ll receive an individual sleep evaluation of your data within one week and you are able to compare yourself with others of the same age. 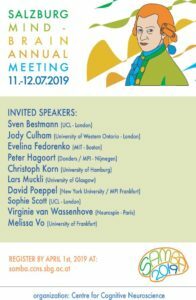 The current promotion vidoe for the Doctoral College “Imaging the Mind” at the Centre for Cognitive Neuroscience (CCNS) at the University of Salzburg and the focus area “Cognitive Neuroscience” please follow the links.